Life by the Creek: Michael is **4**!! Can you believe it? I can't. My baby is four today!! He's growing up so fast. He likes playing baseball, camping, roasting marshmallows, riding his bike, throwing the ball for Chester, helping in the garden, anything with chocolate ;) , The Bugs Bunny and Tweety show, riding on the 'whee-wheeler', playing in the creek, war guys, Monster trucks, and even occasionally playing Barbies and dolls with Becky! 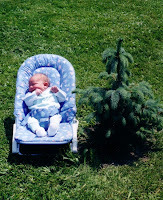 We planted a spruce tree a few days after he was born. 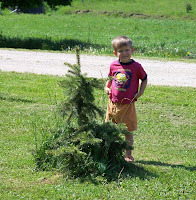 We take a picture of Michael and "Eddie" every year - look how much they're growing! Michael can`t wait to get his presents!!!! And Granny can`t wait to see his face when he opens them. Happy Birthday, dear little man. Yay for Michael! He's a cutie.